Crockett, who has made a career in the private sector consulting businesses away from ruin, said the county could shave millions from its $1 billion budget and streamline and strengthen the delivery of its 300 programs. Crockett also described his consulting experience as being more of a collaborative approach than a top-down management style. “It’s a combination of problem solving, a combination of holding people accountable and … empowering people on the front lines to step up and lead on their own.” Crockett also distinguished himself from McAdams by arguing that his vision of the county was to return its focus to its core mission—delivering high-quality human services that can better help the county’s homeless, mentally ill, at-risk seniors and others. Crockett argued that by tracking people better as they move from the jail to shelters and through the correctional system the county won’t default to dealing with them only when they land in jail or the hospital. “If you tie together what the cost of these people are to the jail and what they cost to mental-health providers and what they cost to homeless shelters and what they cost to our communities—they’re very expensive,” Crockett said. 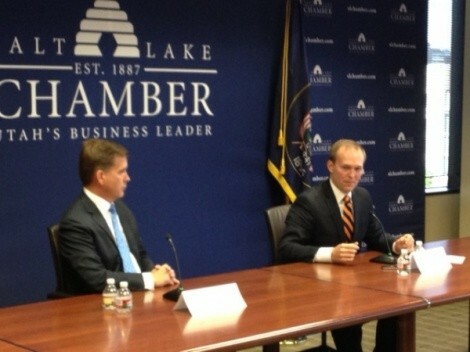 While the debate was hosted by the Salt Lake Chamber, a large number of questions focused on education, a sticking point in the campaign, where McAdams wants to use the county to advocate for better educational programming, while Crockett has spurned the issue as not being a county mission, since the issue is left more to school districts and state funding. “If your primary passion is education then you should run for the Legislature or the school board,” Crockett said. McAdams argued that the county could focus programming better on refugee children, and that if elected he could also organize a coalition of mayors to help advocate on the state level for better education funding and programming. It was a debate where the candidates worked hard to highlight the practicalities of the job over partisan positions. While Crockett argued that the county could help education by “not competing with the state for scarce tax dollars” by keeping spending down, McAdams fired back that he was a “proud” fiscal conservative and noted he was the only Democrat to get the endorsement of the Utah Taxpayers Association. And while it’s often considered a sin for Utah conservatives to accept federal money that would inflate the nation’s deficit, Crockett acknowledged that he “absolutely would” lobby the federal government for money to fund human-services programming in the county. While the candidates exchanged policy punches over and hour and a half, the candidates’ debate boiled down to a job interview before local business leaders about who would be a better manager. Crockett banked on his extensive private-sector experience and dismissed McAdams' experience as a lawyer and working in local government as Salt Lake City Mayor Ralph Becker’s advisor. “You all know the difference between government relations and lawyers, and people who actually run things,” Crockett said. McAdams, however, argued that his corporate-law experience and his management work in local government and bipartisan work at the Legislature make him uniquely qualified.